Open the French doors to take in a completely unobstructed view of Round Lake, Charlevoix's beautiful harbor. This top level, 2 bed 2 bath loft is tastefully decorated in a warm northern Michigan style. 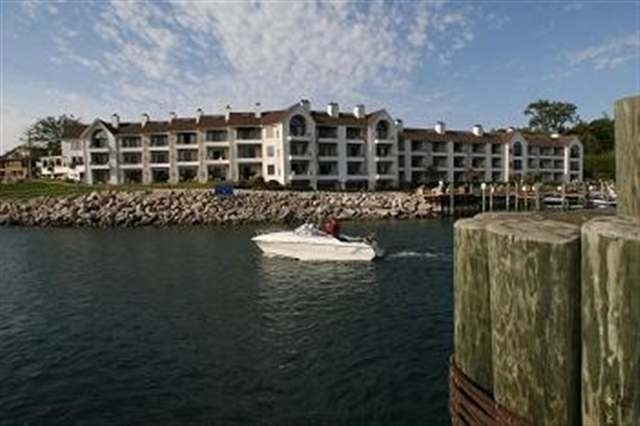 The professional interior design coupled with excellent workmanship and an ideal location makes this Edgewater Inn condo one of the best downtown waterfront condos available. Some of the features include: cathedral ceilings, fireplace, granite, updated cabinetry, custom mill work, 3 flat screen TVs, 1st level custom walk~in shower, 2nd level bathroom whirlpool tub and Charlevoix historical phtography throughout the condo. All Edgewater Inn owners enjoy on~site management, use of heated indooroutdoor pool, spa, fitness room, sauna, and on~site restaurant..